The Green Corn dance at San Felipe is a spectacle as great, as wondrous, as magnificent as any I have witnessed. In fact it is incomparable, unlike anything in our modern life. No football NFL game, no world class Soccer game, no movie, no opera, no ballet, no megachurch service or revival, no rock concert can begin to compare. I had no idea what I was walking into on a hot dry day in early May. It was a short drive from I-25 over to the pueblo. We crossed the Rio Grande River and were in a line of cars leading into the pueblo. Cars were parked all along the road and the road was full of slow moving traffic making their way into the pueblo. We found a place to park and fell in with a crowd of young Indians walking along. I could feel the excitement before we heard the first drum beat and then as we followed a growing stream of people, nearly all of them Indians, the deep booming sound of the drum seemed to be coming up out of the earth, then in a couple more minutes it seemed to clarify and with it we could hear a resonate chant of voices in a singsong verse of unknown sounds, completely unrecognizable sounds that adamantly refused to constitute itself into words, they were sounds of the ancient world, sounds from the earth, sounds in a tongue that could not be configured into words, even in their own pueblo language. They were singing songs of the ancient earth, it sounded like the sound of the corn growing, the sound of the rain falling, the sound of the midst rising, the sound of distant thunder, the sound of the river running, the sound of man and woman in intimate deep embrace, the sound of the horse, the sound of the bison, of the lion, the sound of the sun rising, the sound of moonlight falling on the desert and then there they were, hundreds of them, a spectacle of color and sound. A sight beyond words, beyond comprehension, beyond the frame of our modern abstract understanding. What a feeling. I wanted to cry tears of joy at being there, tears of sorrow at what we as white people had lost so long ago, tears of immense sadness at how these people had been treated for hundreds of years, tears for the lives and land they had lost, tears like the rain to join in the cycle of nature, tears of union with something so primordial, so primeval, so pristine, so immediately present that words could not express it, I could not even begin to say what I was feeling, since the saying put the feeling into another realm of experience that alienated from its source it so that the words fell away unable to give expression to the sights, the sounds, the feelings that arose. We made our way through a line of vendors to where we had a good view. It was a plaza in front of an adobe church, the plaza was defined by the tents of vendors, a large space completely filled with movement and sound, men and women who were no longer themselves but rather were the movement and the sound and the color and the spirit of the forces of the spring time earth, of the growing corn, of the falling rain. 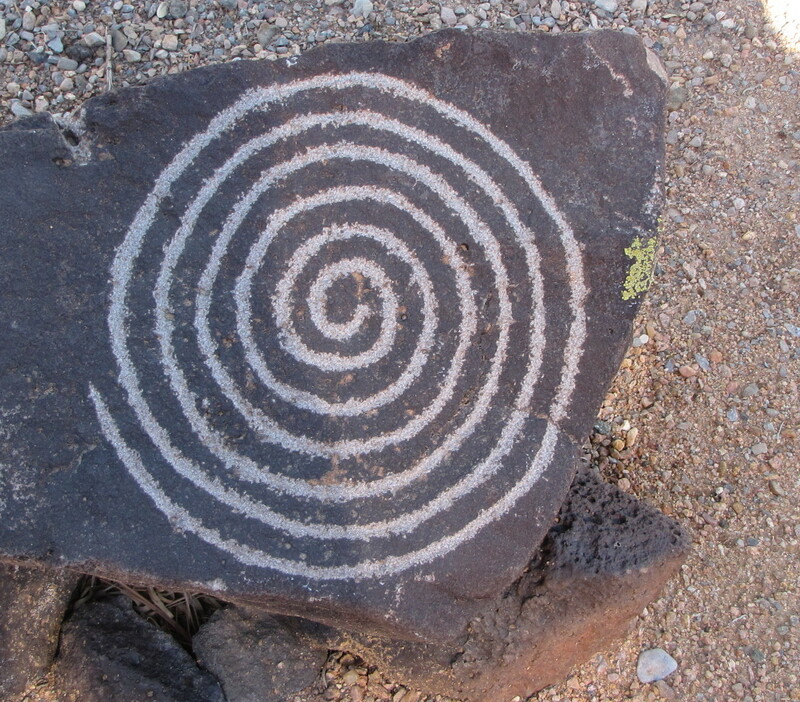 The men were painted with earth tones, browns and grays, their long black hair shining in the sun, with white skirts, with green juniper boughs tied to their arms, a fox skin hanging down behind them, its tail just touching the ground, their white moccasins fringed with black and white skunk skin, a rattle in one hand, a turtle shell attached to their knees, a long necklace of seashells around their necks. The women had on dark dresses, knee length, drawn in with a belt at the waist, one shoulder bare, no moccasins on their bare feet, and a tablita on their heads, blue with stair steeped design cut out on the top and white clouds painted on it, each hand holding the pine boughs which they waved up and down in time with the music. The men’s bodies moving bent over, the women more upright. In the center of the plaza is a group of men in colorful ribbon shirts bunched together around a drummer chanting as the dancers moved like a huge chorus around them. Then another figure appeared holding a tall pole with a long flag attached to it, the flag decorated with painted stylized corn stocks bright green against the yellow cloth of the flag and at the top of the pole a garnish of feather. The pole was moving through the crowd, swooping low from time to time. There was a movement from the man holding the pole and then I noticed one of the men dancers, a young man with long black hair made a distinctive sound with his rattle and then the sound was echoed by each man down the line so it quickly traveled around the circle and when the sound had moved around the entire circle they all sounded their rattles together while the drum beat hastened to a crescendo and then it appeared to be over. All the movement stopped and the lines of dancers broke up and started drifting off to the corners of the plaza. Being there is a beautiful and moving experience, the movement and the sound and the visual impact of watching it all combine into an ethereal, otherworldly experience like stepping outside time, outside the typical American frame, outside all the norms of day to day life, at least for us. The Green Corn dance brings us closer to the origin of things, to the origin of dance, of music, of song, of the land, of the rain, even of life itself, to the plants which transform into the life of our flesh. 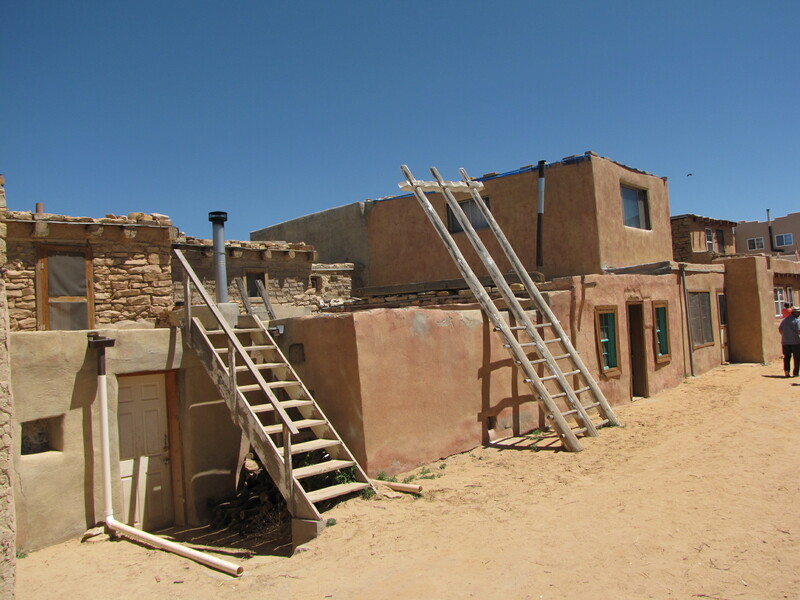 Just as the adobe of the pueblos rises up out of the earth and eventually settles back into it, so the life of the people, individually and collectively rise up out of and fall back into the self same earth. The corn dance is primal and creative in ways that our dance and music have long lost. It is the heartbeat of the earth calling for the rain to fall, to flow in its veins and to rise to form the clouds in the great cycles repeated and reflected in the cycles of the dance. The cycle of dance is a fractal of the cycle of the seasons which is a fractal of the cycle of the movement of the earth around the sun which is a fractal of even larger cosmic cycles that extend beyond our universe, beyond our imagination. An infinite act of fertility from the seasonal planting of the corn seed, to the planting of the human seed to the seed of the earth, the ancient seed of the sun. Finally it is time for us to go. We walk through the pueblo to where the car is parked. In a matter of a few minutes we are back on I-25 heading toward Santa Fe, everyone is very quiet, tired from being out in the sun all day, but astonished and unable to speak, still glowing, basking in the experience, not wanting to even try to put it into words. That will certainly come soon enough and then when we get back to our homes and have to describe the trip to friends and family. One of the purposes of the Green Corn dance is to bring the rain and when we left the dance at the San Felipe pueblo we pulled onto I-25 and headed north towards Santa Fe and there were dark rain clouds on the horizon and a few rain drops fell on the windshield.